We are 1 week away from the Labor Day Parade! We now have t-shirts in our office. 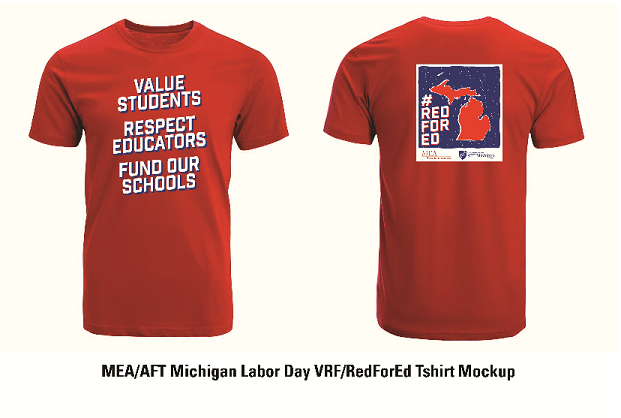 This year AFT Michigan and MEA are standing in solidarity and wearing #RedForEd t-shirts at the Labor Day Parade. AFT Michigan and MEA are calling on members to step-up and commit to volunteering at least one-time before the November 6th Election Day. Every Saturday starting Sept., 15th AFT-MI and MEA will host Education Walks together. There will be opportunities to volunteer throughout the state. We will be reaching out to our members to volunteer. In addition, Saturday Education Walks will be posted on our website once locations are confirmed. When: Monday, Sept. 3rd Line-up starts at 7:00 a.m. and the parade kicks off at 9:30 a.m.
RSVP for the 2018 Metro Detroit AFL-CIO Labor Day Parade here! We are asking members to sign-up to volunteer at least once in exchange for the #RedForEd t-shirts. What do you need to do next? Please join us, make a commitment and stand in solidarity by wearing the #RedForEd t-shirt this year! We have t-shirts available for pick up now-Aug 31st 10 a.m.-4 p.m. Mon-Fri in the AFT Michigan office, 2661 E. Jefferson Ave. in Detroit. Ishpeming – The UP Regional Labor Federation’s Labor Day Festival will be held at Lake Bancroft Park (Lakeshore Dr. and Cliff St.) with a parade starting along Euclid St. at 11 a.m. followed by a picnic and rally from 12-4 p.m.
Muskegon – West Michigan United Labor will hold its annual parade in downtown Muskegon starting at 11 a.m.
Ann Arbor – Ann Arbor Democratic Party’s annual Labor Day Picnic at Burns Park from 4-7p. Suggested donation of $10 for students or union members (with ID), $15 for individuals or $30 for families can be made at https://secure.actblue.com/donate/aadplaborday18.